GERMAN OFFICIALS HAVE criticised plans by the Russian military to build a replica of Berlin’s Parliament building as a target for Russian teenagers to attack at a patriotic theme park near Moscow. German government spokeswoman Ulrike Demmer said today the plan was “surprising and speaks for itself”. “We wouldn’t build something like that for the education of German youth,” added Foreign Ministry spokesman Martin Schaefer. The Reichstag Parliament building in Berlin was the scene of bitter fighting in 1945 between the Red Army and Nazi troops. The building, first opened in 1894, was refurbished after German reunification and in 1999 became the home of the German parliament. 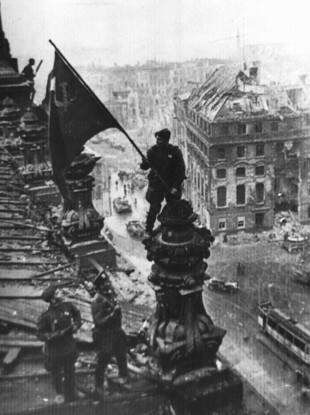 Images of Soviet soldiers hoisting their flag over the building are iconic and are largely viewed in Russia as the symbol of the allied victory in the war. Konashenkov also referred to the 1933 Reichstag arson, which is seen as a pivotal moment in establishing Nazi Germany and hinted that the Germans who are worried about Russia wanting to build a replica building could be Nazi sympathisers. “Verbal attacks by certain German politicians are not only dismaying but they also make one wonder about how these people really feel about the creators of the Third Reich,” Konashenkov said Friday. The Kremlin has turned to World War II to encourage patriotic feelings, as the country’s massive wartime suffering and enormous losses during that time form a key element of Russia’s national identity. Victory Day has remained Russia’s most important secular holiday, a rallying point for a nation deeply divided over its Soviet-era history. Read: How different is the story of someone fleeing Syria to that of a World War II refugee? Email “Germany's anger after Russian theme park creates mock-Reichstag for children to attack”. Feedback on “Germany's anger after Russian theme park creates mock-Reichstag for children to attack”.